Eighth graders Sid Israni and Owen Levesque know their way around a lacrosse field! 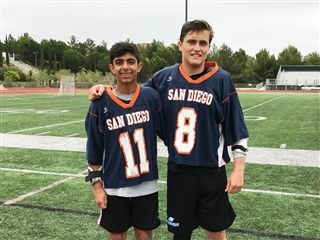 The two were selected to play in the San Diego Chapter of the US Lacrosse All-Star game last weekend on the North County team. Sid and Owen were nominated by Coach Elsdon and Coach Collins for exemplifying team work, outstanding lacrosse skills and an above average understanding of the game. They won the game against the South County students, 15 - 10.